How to buy the best pushchair - Which? Find out what makes a good baby pram and toddler pushchair, and read our practical pushchair shopping tips to help you avoid the pitfalls. Finding the perfect pushchair, travel system or stroller for your little one requires you to make a number of decisions. So to help you on your journey, we've distilled the key considerations into five categories. How much do I need to spend on a pushchair? Take a look at our best pushchairs to discover the models we recommend. Pushchairs vary enormously in terms of cost. You can spend anything from less than £100 to more than £1,000, but in some cases you'll be buying a desirable name and fancy fabrics rather than a practical pushchair that's easy to use and push. Nearly three out in five parents* told us they suffered buyer’s remorse after bringing their pushchair, pram, buggy or travel system home and using it. The parents we spoke to spent £430 on average, so it’s not a cheap mistake to make. We've found Best Buy buggies from as little as £150, so you don't necessary have to spend a large amount to get an excellent stroller. Not all pushchairs are suitable for a newborn baby. Before you set your heart on a Bugaboo or an iCandy, check whether the seat is suitable from birth or if it can only be used by babies over six months old. Newborn babies can't support their own weight when they're so small, so have different needs from older babies and toddlers. It's important they lie flat in order to support their developing spine and allow them to breathe easily. a carrycot: it's best for babies to sleep on a firm horizontal base, so if you’re expecting to use the pushchair for lengthy daytime naps, or whole afternoons in the park, choose one that can take a carrycot. Most pushchairs come with a carrycot option, which attaches either straight on to the seat or using adaptors. It's best to wait until babies are around six months old, or when they start to sit up on their own, before you use a pushchair seat in its most upright position. What makes a good baby pram or pushchair? Small niggles and frustrations will become very annoying when using your pushchair on a daily basis, so choosing the right one is essential. Before you splash out, read our pointers below to avoid a dud. Reversible seat: Many parents like to have their new baby facing them to maintain eye contact, so a reversible seat is a good feature. This means you have the choice to keep them parent-facing while young, then world-facing when they're older. Adjustable handles: Being able to easily adjust the height of the handlebars will make it much more comfortable for you to push, especially if you're a different height from your partner or anyone else using the pushchair. Shopping basket size: Capacity varies from 1kg to as much as 15kg, but the average pushchair shopping basket can hold 4 or 5kg. Look for a basket that has sturdy sides and good access, even when the seat is reclined. Additional storage pockets around the pushchair are also useful. Padding: Prams that have extra padding, such as a head hugger, will help to keep your baby supported and snug in their new pushchair. Folding: An easy-to-use folding mechanism is essential. You'll be folding the pushchair day in and day out, so try this out before you buy. Many pushchairs are claimed to have a one-handed fold, but not all deliver on this promise. Uninterrupted stride: Probably not the first thing you'd think of when choosing a pram, but check you're able to walk with the pushchair using your normal stride. Also make sure you don't scrape your shin on a rear axle, brake bar, shopping basket or any other accessories. Brake pedals: The best have large pedals that are clearly labelled, easy to apply and effective. Look for brakes that you can press on and off to avoid scraped toes or shoes. Size and shape: Bulky and heavy pushchairs can be hard to push, lift and generally manoeuvre. A good pushchair can be big without being difficult to use. 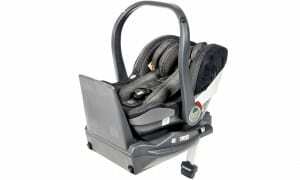 Travel-system compatible: All the benefits of a pushchair, with the option of using a car seat on it. 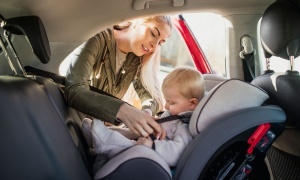 Travel systems, which you can use with a Group 0 or Group 0+ car seat, are a good choice for regular car users, as you can transfer your baby from pushchair to car without waking them up. Just bear in mind the current safety advice that babies shouldn’t be confined to their car seat for longer than two hours. Learn more in How to choose the best travel system. Check out the 10 best travel systems. In our video, parents share tips on what they wish they'd known before they bought their first pushchair, so you don't have to make the same mistakes. Find out which are the most common pushchair faults in our guide to pushchair safety, so you know which features you need to check twice before buying. Pushchairs with bucket seats have a fixed angle, so they're only suitable for babies older than six months. This is the usually around the age a baby can start sitting up on their own and supporting their own weight. When you recline a pushchair with a bucket seat, the angle your baby is held in doesn't change, and you're effectively only tipping them back. Some experts believe this isn't the most comfortable way for your baby to sleep. Travel systems with multiple seat-recline positions are suitable to use from birth with the seat in its lowest position (or if you use a carrycot). Older babies and toddlers can then use the seat in its most upright position. Our tests check the ergonomic support given at each stage for every pushchair we review. A strollers, or buggy, is a lightweight and basic version of a pushchair. Some can only be used with older babies (more than six months) and toddlers, as they don't recline far enough to be suitable from birth. But there are some models, such as the Babyzen YoYo and the Silver Cross Reflex, which you can use with an accessory pack to turn them into a from-birth pram. Try before you buy: Always try a pushchair before you buy it, either in the shop or borrow a friend's, so you can get a proper feel for how it handles and folds, and and whether the storage is really adequate. Don't leave it too late: Trying out pushchairs with a large bump can be tricky. Check how heavy it is: A lightweight buggy can make life easier for getting on and off buses or carrying it up a flight of steps, for example. Make sure it will fit in your car boot: Our pushchair and pram reviews tell you which models will fit in a standard-sized family car, and with how much room to spare. An older design might save you money: Pushchairs are subject to fashion; patterns, designs and materials regularly change, so last season's designs can often be found cheaper. Check what's included in the price: You can only make meaningful price comparisons once you know what accessories are included. For instance, you might need to pay separately for a rain cover with some models, and some travel-system pushchairs charge extra for car-seat adaptors. Add it to the gift list: Some baby shops and online stores, such as Mamas & Papas, operate a baby-shower gift list service along the same lines as a wedding list. This means you can ask friends and family to chip in for the pushchair you've set your heart on. Buy now, pick up later: Some retailers will let you buy your pushchair, then hold on to it for you until nearer your due date, to save you space at home. Plan ahead: If you're thinking of having more children in the future, opt for a single-to-double convertible pushchair which will allow you to easily change it from a single into a double buggy. Now find the perfect pushchair for you by checking out our pushchair reviews.